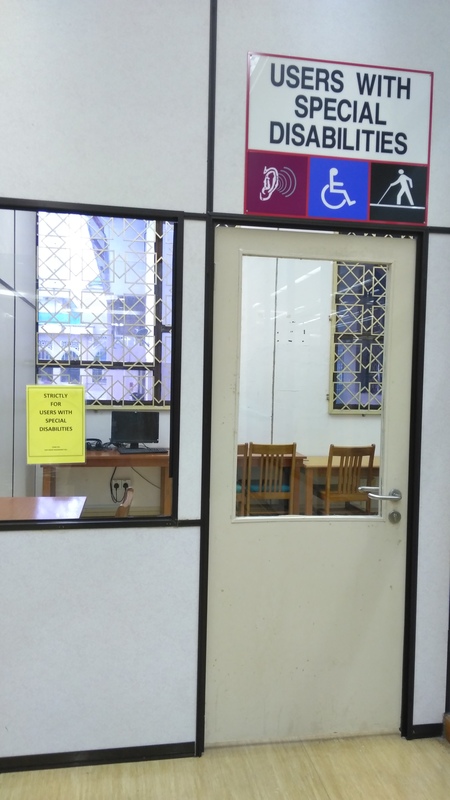 The IIUM Library is committed to providing equal access to our services and facilities for all users. We are working to make library accessible for all. Kindly email to library@iium.edu.my for any suggestions and ideas. Two external ramps access to entrance and handrail on steps. Automatic opening IN and OUT door entrance and a swing gate to bypass Pedestratian Gate. Lift with voice indicator providing access to all floors. Two units of Personal Computers with large LCD flat screen. One unit for accessing Library Catalogue (OPAC) and one for internet access. All PCs has basic Microsoft accessibility options, including an on-screen keyboard and a magnifier. Special Reading Tables - Three units of special reading tables with different heights are provided for reading and discussion purposes in the room. TV and Video Player - A set of TV and Video Player is provided for watching video in the room. Braille Collection such as Tafsir Al-Quran and dictionary are also available in the Room. Low Circulation & Multimedia Counters Circulation and Multimedia Counters at Level 2 and 3 are of suitable height to acommodate various users. Carrel Room for Special Users Two units of single Carrel Room are available for users with special disabilities on Level 2. Kindly approach staff at the Circulation Counter to get access to the room. Toilets There are separate male and female toilets for users with special disabilities at every level. Nearest accessible toilets is on Level 2 (Entrance Level). Request assistance from staff at the Readers Advisory Desk or Circulation Counter. Circulation and loans services - Contact Circulation & Loans Officer (+603-61964822) or email to csd_lib.iium.edu.my.